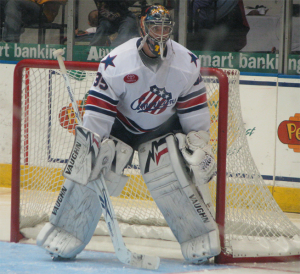 4th Straight Win for the Amerks · Let's Go Amerks! 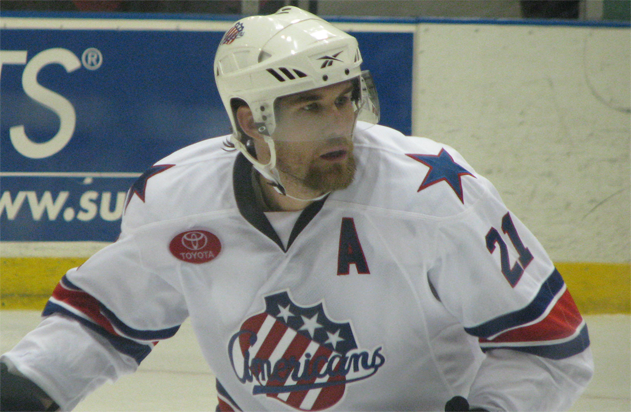 The Amerks defeated the Binghamton Senators on Wednesday night to extend their winning streak to four games. The last time the Amerks won four straight was the first week of November 2007. I have not looked yet to find when the last time they won five straight in fear of jinxing the situation. Assuming this style of play continues the questions about “last year” will fade away, but until then they’re still relevant. It’s a different atmosphere around the team, the front offices, and even in the stands. It was very strange back by the locker rooms after the game. Usually the visitors side hallway is filled with guys stretching, cooling down, and getting their gear packed up. On Wednesday night it was very.. quiet. I’m assuming the Binghamton coaches were letting the team have it. Anyways, it was great to see that happening on the visitors side and hearing loud music coming from the Amerks locker room. About five minutes later Evgeny Dadonov also scored his first professional goal off a great backhand past Andy Chiodo to give the Amerks a 2-0 lead. Graham Mink started the play by trying to put a back hand through the pads of Chiodo.. Chiodo made the save, Taylor got the rebound and took a shot, Chiodo made another save and Dadonov came from the back of the net and easily put it in. Anyone out there speak Russian and would be interested in interpreting an interview sometime after a game? It only took another 29 seconds for those same three players to give the Amerks a 3-0 lead halfway through the first period. Dadonov was on a fast break down the right hand side. He took a shot and Chiodo made the save and sent the rebound to the opposide side of the ice. Chris Taylor was there waiting, took another shot and Graham Mink was standing right in front waiting for the rebound. Following the third goal by the Amerks the Binghamton Senators took Andy Chiodo out of the net and put a familiar face into the game, Mike Brodeur. He said he had a feeling he wasn’t going to get the start, had hoped but knew it wouldn’t happen. 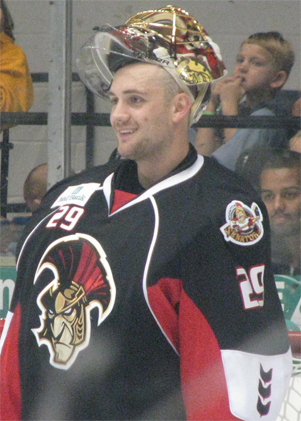 Chiodo had played well in the Senators previous game. Mike York finished off the scoring for the Amerks at 1:54 of the second period on the power play to give the Amerks a commanding 4-0 lead. He took a nice hard shot from the right hand side that went through Chiodos five hole. Just over three minutes into the second period we got a glimpse of the physical game that Oreskovich is capable of. Jim O’Brien was starting to skate up the ice out of his zone when he Oreskovich sent him flying backwards to the ice with a big hit. Tomas Kudelka quickly went after Oreskovich and Bonneau was also quick to the scene to mix things up. With the Senators being down 4-0 they started playing a more physical game, trying to do something to gain some momentum, trying to get Tyler Plante off of his game. I counted at least five times that a Binghamton player crashed into Plante pretty hard. It didn’t work. Referee Francis Charron called two goaltender interference penalties against the Senators, a couple of more could have been called that weren’t. A few times when there was a mixup in front of the net you could see a blocker and a glove aimed at an opposing player. The two teams play each other nine more times, it’ll certainly be an interesting season. Binghamton got on the scoreboard at 10:46 of the second period off of two great passes on an odd man rush into the Amerks end. Josh Hennessy slipped a pass past Jason Garrison to Martin St. Pierre who then fed an even cleaner pass over to Ryan Keller on the opposite side of Plante and tipped it in. Geoff Kinrade of the Senators scored at 5:33 of the third period to make it a 4-2 game. The Amerks are on the road Friday night in Albany, Saturday in Syracuse, and back at home Sunday evening at 5pm to play the Syracuse Crunch. 1st Period-1, Rochester, Oreskovich 1 (Matthias), 5:10. 2, Rochester, Dadonov 1 (Taylor, Mink), 10:28. 3, Rochester, Mink 2 (Taylor, Dadonov), 10:57. Penalties-Bonneau Rch (interference), 5:26; Spencer Bng (fighting), 10:59; Bonneau Rch (fighting), 10:59; Taylor Rch (interference), 16:50. 2nd Period-4, Rochester, York 3 (Ellerby, Oreskovich), 1:54 (pp). 5, Binghamton, Keller 5 (St. Pierre, Hennessy), 10:46. Penalties-Hamel Bng (tripping), 0:42; Kudelka Bng (roughing, roughing), 3:09; Bonneau Rch (roughing), 3:09; Daugavins Bng (goaltender interference), 11:21; Smith Bng (boarding), 16:53. 3rd Period-6, Binghamton, Kinrade 1 (St. Pierre, Hamel), 5:33. Penalties-Henry Rch (interference), 1:48; Plante Rch (delay of game), 5:51; O’Brien Bng (goaltender interference), 7:50; Oreskovich Rch (slashing), 9:56; Keller Bng (roughing), 16:44; Kudelka Bng (roughing), 16:44; McArdle Rch (roughing), 16:44; Repik Rch (roughing), 16:44. Shots on Goal-Binghamton 10-9-11-30. Rochester 12-14-9-35. Power Play Opportunities-Binghamton 0 of 5; Rochester 1 of 5. Goalies-Binghamton, Chiodo 0-4-0 (9 shots-6 saves); Brodeur 2-1-0 (26 shots-25 saves). 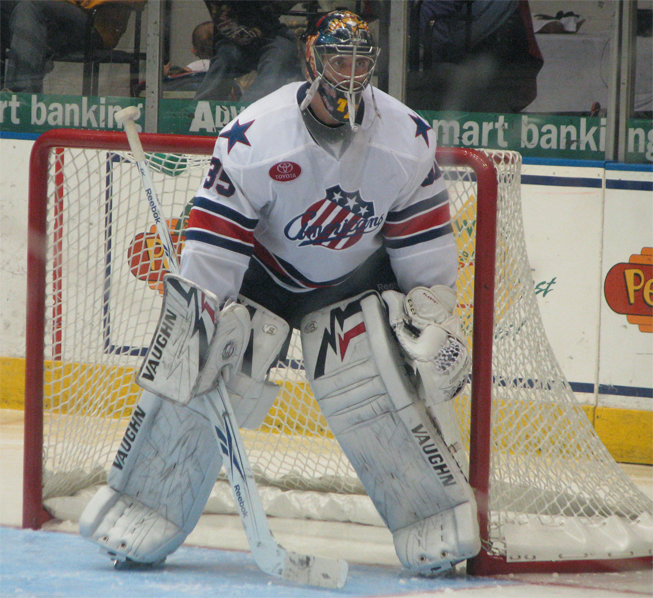 Rochester, Plante 3-2-0 (30 shots-28 saves). Linesmen-Peter Feola (33), Tim Kotyra (53).